The Who were one of the most memorable and influential of the 1960s British Invasion bands—memorable because of their loudness and because they destroyed instruments during performances, and influential because of their success in crafting “Power Pop” singles like “My Generation” and “I Can See for Miles,” long-playing albums Live at Leeds and Who’s Next, and the “rock operas” Tommy and Quadrophenia. The themes that principal songwriter Pete Townshend imparted into The Who’s music drew upon the group’s mostly working-class London upbringings and early Mod audiences: frustration, angst, irony, and a youthful inclination to lash out. Like some of his rock and roll contemporaries, Townshend was also affected by religious ideas coming from India and the existential dread he felt about the possibility of nuclear war. During a career that spanned three decades, The Who gave their fans and rock critics a lot to think about. 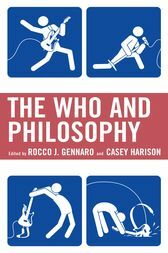 The remarkable depth and breadth of The Who’s music and their story as one of the most exciting and provocative rock bands over the last half-century are the subjects of the philosophical explorations in this collection. What a terrific book! Harison and Gennaro have assembled a wide-ranging collection of essays spanning the academic, the intellectual and what is oftentimes just plain fun. Any deep fan of the Who has spent plenty of time reading into the band’s Mod antecedents, the symbolism of violence in the destruction of their instruments on stage, Townshend’s simultaneous striving for the power and permanence of opera while insisting that pop music is ephemeral, and how Meher Baba has lain a continuing religious thread through Townshend’s musical ideas. This book is for that fan, and anyone trying to look for their own philosophical thread running through the songs and career of rock music’s most philosophically adventurous act. Rocco J. Gennaro is professor of philosophy at the University of Southern Indiana. Casey Harison is professor of history at the University of Southern Indiana.